Home / Other / Are Dental Implants Right For Me? Dental Implants have been around for over half a century and are fast superseding more traditional tooth replacement options such as bridges or dentures. 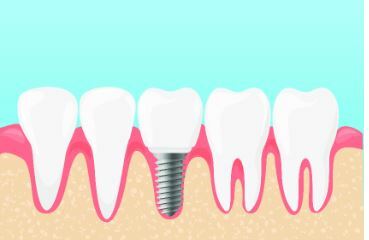 Implants by far, offer a superior option as they don’t have to be attached to healthy adjacent teeth which usually need to be cut or modified in order to “close the gap” created by a missing tooth. 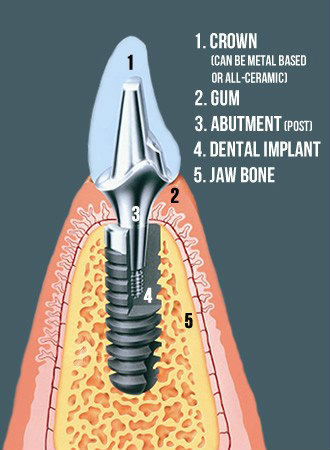 An implant replaces the root of the missing natural tooth, and in doing so is made to measure and prevent any loss of the remaining jawbone. I have 32 Teeth – so what’s the big deal about missing one tooth? As a typical adult has 32 teeth, it is understandable that people may think that the loss of a single tooth especially at the back of the mouth will not be a big deal. Some teeth are shaped to bite into food whilst others need bone support for chewing and grinding. In short, the forces associated with chewing need an even distribution throughout all the teeth and without the support of other surrounding teeth the processes will enhance the likelihood of dental collapse. It’s a bit like driving a car with a tyre that has a small crack; you can continue to drive with few problems. A point will come, however, when this will start to present problems to other functional areas of the car which in turn will turn into major mechanical problems reducing the lifespan of the vehicle. The survival of dental implants cannot be guaranteed; however, it is reasonable to predict that they can with proper care last a lifetime. Many will last for over 20 years and there are some that have lasted for nigh on 50 years. How do Implants change the quality of people’s lives? Dentures can be difficult to manage and cause the wearer a lot of heartache, embarrassment and distress. As you age your jawbone constantly changes shape and gets smaller, as a result bone loss is inevitable. Consequently, dentures need to be constantly relined constantly to adapt to these changes. Mouth sores associated with dentures also exacerbate the situation. Worries associated with ensuring dentures being loose or ill- fitting or staying in your mouth when you chew and speak are significantly reduced by opting for full dental implants. These can be inserted to stabilize and support surrounding teeth and transform the way people enjoy life. So, if you are tired of dentures and would like to regain the ability to eat and speak with confidence, we offer dental implants in Richmond. Call us on 0208 940 5071 and book a consultation with our specialist.